Easier than the arcade version, and nearly as good. Some of my earliest gaming memories are of DK Jr., though I wasn’t playing it in the arcade or on an NES, but rather on the legendary ColecoVision console system. One of my best friends had a fully loaded Coleco system, including a truly enviable collection of games that included epic titles such as Mousetrap, Pepper II, Turbo, Kaboom, Dukes of Hazzard, and Carnival. 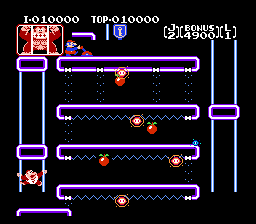 Though it faced significant competition for our time and devotion (my friend had at least 50 cartridges), Donkey Kong Jr. was always one of our favorites, mostly due to the revolutionary platforming action and the approachable difficulty (especially compared to its predecessor). A game with clearly defined objectives and a variety of obstacles was a real treat; so many titles of that era amounted to single screen challenges with only a vague story or premise. Enter Donkey Kong Jr.; he’s got a father figure we love to hate, but now the tables are turned and pop is in jail. . . and get this– mind = blown –there are FOUR different levels to tackle. It’s no joke; we loved the game so much, we’d stage live-action DK Jr. recreations in my friend’s backyard tree, complete with cardboard monster cutouts and a dangling key to grab. So . . . I’ve got some history with this game. . . moving on. . . In preparation for this write-up, I went back and watched some videos of the Coleco version (I still haven’t added this system to my collection, but just wait for it). . . wow. The contrast between the NES adaptation (albeit via 3DS) and the Coleco translation really illustrates the giant leap forward that the NES represented for video game graphics. While the NES visuals closely mimic the lush, colorful animations of the arcade machine, the ColecoVision still rendered many sprites in blocky, single-color designs (the enemies look particularly bad in the earlier version). Coleco represented a huge technical improvement over Atari 2600 and had a bigger game catalog than the 5200, but comparing the NES version of DK Jr. to a Coleco title designed three years earlier is not technically fair or entirely relevant. Nevertheless, the side by side comparison was a welcome reminder of the drastic distortions that nostalgia can have on memory. DK Jr. is a fairly standard 4-screen proto-platformer, though calling it “standard” is probably unfair, since games like DK Jr. were the prototype for the genre. First famous in arcades, this game has been ported across countless systems is one of the most enduring and popular ever created. With that in mind, young whippersnappers may need to approach this download with a degree of forgiveness; I mean, I hadn’t played the game in years, but even on my first 3DS attempt, I was able to handily defeat the first four stages without a single Game Over. I cringe to imagine how the simplistic gameplay, occasional flaws, and repetitive motifs appear to a player who didn’t (literally) grow up in dark, grimy arcades; frighteningly, the majority of 3DS owners probably weren’t even alive to play the NES incarnation, much less ever lost small fortunes to games like Rampage, Jungle Hunt, or Berzerk. DK Jr. unquestionably retains a respectable degree of charm and appeal, though I am an acknowledged, ridiculously-biased retro-freak. The NES version has entertaining (even “cute”) animations that are nicely coupled with satisfying sound effects and responsive character movement. Scaling vines and chains with DK Jr. is a weirdly entertaining experience; the skilled player can almost achieve a sense of graceful apelike motion as you thread your way across each screen (common, use your imagination!). You’ll slip down vines like greased lightning to escape fast-moving enemies, or use a speedy two-handed climb to scale chains and grab bonuses. There isn’t a heck of a lot of strategy here; like his daddy’s game, your basic goal is to reach the top of each board while scoring points and avoiding traps. This is the simple stuff of the early 1980s–basically, just don’t let DK Jr. fall into a pit or come in contact with enemy sprites. I tend to feel that (NES) DK Jr. is far easier to control than Mario in the original Kong; he jumps higher, moves quicker, and the collision detection definitely seems a bit fairer. You’ll struggle to understand why a downward leap of say, 4 pixels, will not harm the adventuring ape, while a dizzying fall of 6 pixels spells instant death–but after you’ve run through the boards a few times, you’ll have a passable understanding of the game’s physics and limitations. And if classic arcade is your cup of tea, you be having fun. The music is pure 80s arcade, and since the ColecoVision version did not include the computer level, I’d never experienced this added challenge or the awesome, iconic bloop-bleep 70s-era sound effects that accompany it. And no review of DK Jr. would be complete without acknowledging the presence of Mario as villain–something unbelievable to kids who only know the saccharine-sweet persona of the carpenter/plumber/hero–yet there he stands, cracking a whip over weird alligator-like toadies and looking generally nasty. It makes one reflect on the wild ways in which video games and corporate mascots have changed over time. In recent years , I’ve had a couple chances to play the original arcade version (visit Funspot in Laconia, NH to try it yourself) and I can say without hesitation that this NES translation is a much friendlier, tempered version aiming to reach a wider, less compulsive (perhaps less self-abusive) audience. Playing the upright machine, I still hadn’t passed the first board after 2 or 3 quarters, but I could be confusing it with the insane difficulty of Donkey Kong II. In any case, since a huge number of you will be playing the NES version of Donkey Kong Jr. for free, I’d say it’s worth your time and at least a short period of obsessive vine-climbing devotion.